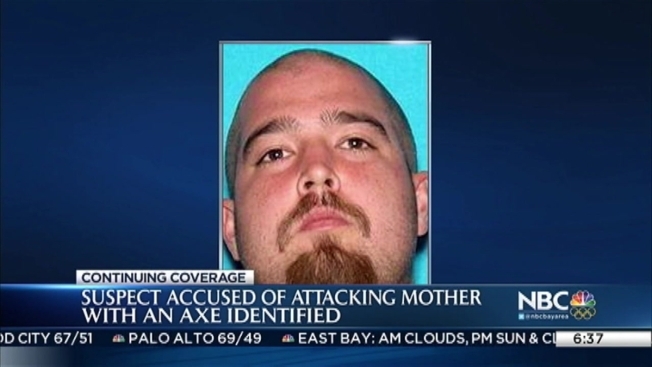 San Jose police identified the man who they say attacked his mother with an ax, and explained that they ended up shooting him with a gun because he didn't drop the weapon after they Tased him. Sgt. Enrique Cannon said in a statement Thursday that two officers ended up shooting 26-year-old Daniel Rynazewski on Wednesday about 7:15 a.m. in the 1400 block of Lansing Avenue twice. Garcia said the officers - 24-year veteran Glenn Baldwin and three-year veteran William Hall - saw Rynazewski's mother chasing her son around the front of the house. Her son was armed with an ax and struck his mother in the back, police said. One of the officers Tased him "with little effect," Garcia said. Rynazewski then raised the ax and struck his mom in the head, police said, which is when the officers fired at him with their guns. Rynazewski fell, and was taken into custody. He "sustained multiple gunshot wounds," Enrique said, but he survived, along with his mother. Both were taken to the hospital. Garcia said he will be booked on charges of assault with a deadly weapon and attempted murder. The officers were put on paid administrative leave. Trish Harvey, a family friend, showed up at the scene in shock after the attack. "It's just so sad when someone you know goes through this," Harvey said. "It's like it hits home." Harvey said the suspect suffered from a mental illness. This is the second instance in less than a month where a child has been accused of attacking a parent, and Lt. Tom Sims said it was not easy to explain the "family on family violence" in the last few weeks. San Jose police arrested two brothers, Hasib and Olam Golamrabbi of San Jose, who were charged with killing their parents on April 23 in their Evergreen home. The shooting marked the third officer-involved shooting of the year -- one was fatal -- and the second involving a family conflict, the Mercury News reported.